Paul Offit teaches doctors to ignore pharmacutical package inserts, calling the medical information morally and ethically required be given to patients who could be harmed by said pharmacutical, "the bane of [his] existence." Not something that the physician needs to use to fully understand the Rx they might offer to a patient, "the bane of his existance." He is not a doctor, he is a pharma sales rep.
"I know you doctors keep telling me that vaccines don't cause autism. If that's true, then why is it on this package insert?" he asked, playing the role of a parent who had read the blogs and heard the celebrities who connect the two. Shifting in her seat, the designated victim shot Offit an unsure look. Then she began citing studies and said that drug packaging inserts include many "temporally associated symptoms" that weren't necessarily caused by the vaccine. "Why?" Offit pressed. "Why would they put that there — just to scare me?" The doctor kept trying. "They're required by law," she said. "I actually didn't know the answer." 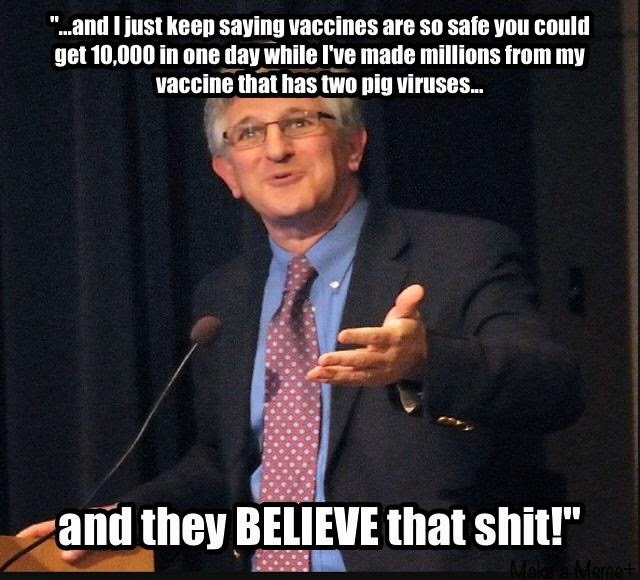 Offit broke character to explain: Drug companies must list any condition known to have occurred within six weeks of a vaccination, whether the medication caused the condition or not, and even if it occurs at the same level as with a placebo. Package inserts are legal documents, not medical documents, he said, calling them "the bane of [his] existence." "If you look at the original package insert for chicken pox vaccine, it says, 'Broken leg has been associated with this drug,'" he added.